As the Internet infrastructure evolved over recent years, services running on it become more visible and tangible to the world. Internet as an infrastructure is less talked about these days. Rather, services running on them are counted with more reverence. We are thinking about building further upon those services and forget the Internet as the fundamental infrastructure and fail to see its virtues. Twitter started as a small microblogging service, built on top of the Internet, has grown into an infrastructure over a few years. Now there are numerous business-critical (if not mission-critical) services built on top of Twitter. Twitter is a service built, owned and operated by a single entity. The whole of the Internet depend on Twitter for microblogging. If email service followed the Twitter way, we would have had only one Hotmail or Gmail and remained as a single point of failure. Think of microblogging service as a decentralized infrastructure; like email or instant messaging. Email infrastructure can be set up by anyone yet can exchange emails with any other email server (its users) in the Internet. So does IM (with inter-domain federation). Why not the same with microblogging and liberate it from its current bulletin board architecture? Microblogging URI can also take the form of email address similar to how instant messaging with federation works. For example, Google could set up a microblogging service for its own use and microblogging feeds of Larry Page could be possibly available at larry@google.com and corporate feeds could be available at wire@google.com. Client software like TweetDeck can fetch feeds from respective servers. Any one can subscribe, route, federate feeds from any any microblogging server. In that situation, microblogging is not dependent of any single provider and so there is no single point of failure. It will work just like the email system. There can be a feed management layer like what Feedburner does to RSS/Atom feeds. In fact Twitter is best qualified to provide this layer now. This will make microblogging totally decentralized. This architecture is a very natural one for an Internet service. Above all this will take away the responsibility of running the microblogging service for the whole of Internet from any single entity. 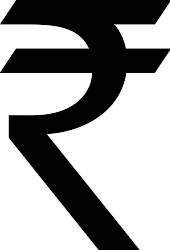 India gets new currency symbol. Whole of India is excited about it and so am I. Now waiting for type face designers to include the symbol in my favorite fonts. Government of India approved a currency symbol design contest last year. And the year-long competition came to an end and the winner is an IIT’ian. He designed a symbol which is described as “combination of the Devanagiri letter ‘Ra’ and the Roman letter ‘R'”; both first letter of the Indian currency name “Rupee”. Many people around the world still think that India, along with the neighboring countries such as Pakistan, Sri Lanka and Bangladesh share the same currency. So this move is going to make Indian Rupee distinctive. Media welcomed the symbol as it shows off the strength of the up coming currency. But I see some problems with its design! Have you tried using this symbol? Not yet? Pick a pen and try it yourself right now before you read further. Well, how does it look? Just look at your best attempt. And now try writing Dollar, Pound Sterling and Euro symbols and see. I don’t expect you to be a freehand drawing expert; but as a common man, what do you think? Can you see a difference? What’s the problem? Besides proportion requirements, this symbol needs those “calligraphy edges” for that finished look. Its elegance depends a lot on those beveled edges and that is quite unfortunate. To create those edges, you need thick lines. That is the problem here: this symbol won’t look as good in thin lines line (i.e. while writing with regular pen or in regular font set)! This symbol needs to be bold face–always. A good shape that is tolerant to imperfection while writing. A good shape that would look good irrespective of the thickness of the line it is drawn with. A good shape that has a fairly good degree of symmetry. A symmetric symbol has lot of flexibility and possibilities while designing type faces. And easy to draw too. The symbol started appearing in news papers and other print media already. People try experimenting with it now in headlines and advertisements where they can use a bold type face. Now my mind is getting conditioned to it though I am yet to see it in body texts. I wish someone could come up with a one-pixel version of the symbol so that it can used in body texts. Also a variant for writing by hand.